You are here: Home » Chocolate and no calories! The prospect of calorie-free chocolate may seem appealing but when it is covering your broad beans it can be a real nuisance! Broad beans are one of my favourite veg and they are easy to grow. Unlike some other beans they are hardy and can be sown in spring, where they are to crop, before the last of the frosts, or you can sow them in autumn, in October, to overwinter but, to be honest, I have never quite seen the point. There is a good chance that a wet or cold winter will nobble them and the recommended ‘Aqualduce Claudia’ is not the best-eating variety. But there is one disease that is waiting to annoy you, as well as the inevitable blackfly. 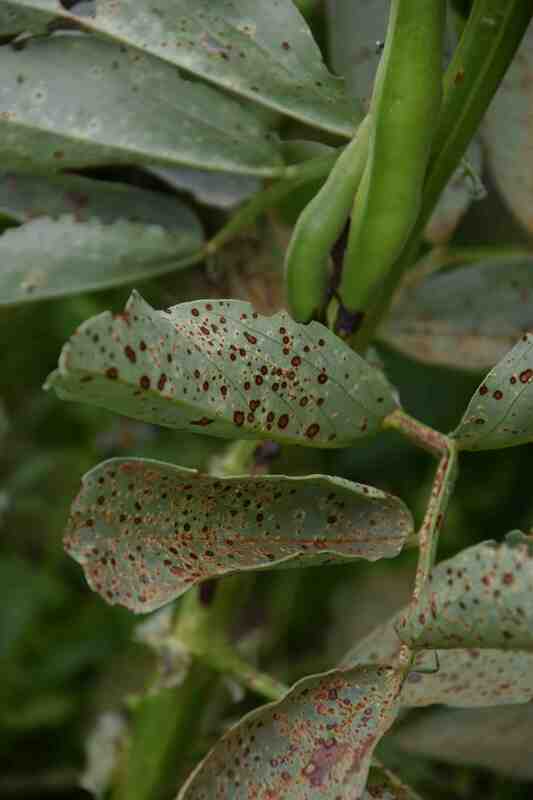 Chocolate spot (Botrytis fabae) is a disease that is worse in wet springs and although it often starts off as just a few tiny brown specks on the leaves it can soon spread, in wet conditions and if the plants are too crowded (so the leaves do not dry out) the fungal disease can spread alarmingly and ruin the plants. The good news is that a spell of dry weather will control the disease, because there is no chemical you can use. And it does not affect any other types of bean. 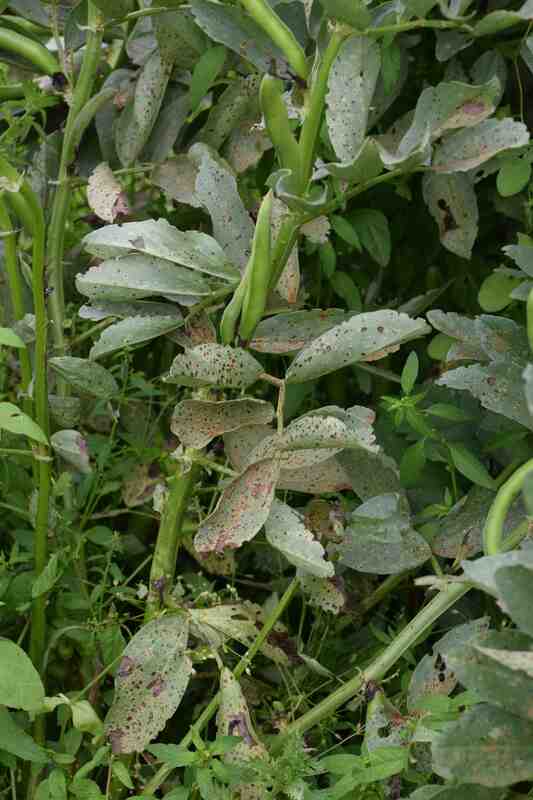 In fact the only other plant it attacks is common vetch, which is a problem in rural areas because it means that if you have vetch in the area you may have a ready source of infection. So all you can do is keep an eye on your plants and pull off any infected leaves at the early stages. And if the infection is to bad it may be just as well to pull up the plants early. Oh, and don’t keep seeds from these plants because you will inevitably get spores from the outside of the pods on the seeds as you clean them and you will infect the next generation from the start. our favorite to lovely and young broad beans and its a good year for them . Interesting. Have to admit I always sow Aquadulce Claudia but woild love to know which othrr varieities you recommend for better taste. I always grow Robin Hood which is a compact plant with smaller pods – it is the one I grow every year. I also like Statissa and Stereo which again have small pods and small beans. I used to hate broad beans when I had to eat them when they were huge with plastic skins but now I can pick them when they are small and do not need peeling I love them! Thanks for that Geoff. Might not have to double pod tbem any more! Moulds and fungus in abundance this year…. Will this mildew spread to my other plants?